What is the Best Cheap/Bargain/Deal Camera for 2019? What are the important camera features for a cheap, bargain, budget, great deal camera? That question is easy to answer. The primary feature a cheap or budget camera requres is a low price. Of course, a bargain camera may have a lower price, but provides a lot of value for the cost, making it a great deal. Some can only afford a small amount. Some do not use a camera enough to justify spending a larger amount. Some do not want to be concerned about the camera's safety, including theft, misplacement, use by kids, etc. Even professionals want cheap cameras sometimes, such as when one (or many) are likely to be sacrificed while capturing a high-risk photo. A cheap camera can make a good backup camera option. Higher end camera models have more features, but if you will never make use of those features, even as you grow in your photography skills, those features hold no value and can even complicate use of the camera. Those undecided about their level of interest in photographer may be looking for a cheap starter camera until they decide how important photography is to them and what features they need. So, for some reason, you find yourself interested in a camera in this category. You still want a great camera, but you don't want to pay much for it. Fortunately, even Canon's lowest-end DSLR and mirrorless models feature excellent image quality. Before I go over the list of cheap Canon cameras, I'll share a list of tips on getting the best deal on a Canon camera. 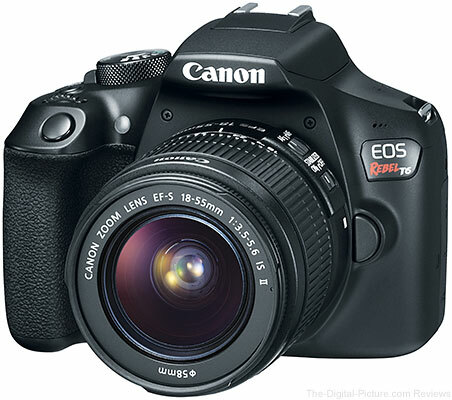 The best Canon camera deals are the Canon USA refurbished models at the Canon Store. These cameras are typically retail returns that have gone through a thorough testing process. They may not come in an original box, but they appear as new and come with a same-as-new warranty. Learn more about Canon refurbished gear here. Using this link, sort by price descending and the cheapest cameras will be at the top. I regularly buy refurbished Canon cameras and lenses and have always been pleased with that decision. For the ultimate camera deals, watch our news page/feed for Canon refurbished sales. If you don't need the latest and greatest features, buying one or two models back within a product line is a good money-saving tactic. The new models always have improvements, but we have had great cameras for many years. Camera technology has matured enough that even two-generation-old cameras are still very capable. Perhaps the easiest cheap camera purchasing tactic is to simply buy the camera with the lowest price. Search for Canon EOS Camera and order the results by low price (select the digital camera category to remove the accessories). For those willing to take a slightly higher risk, buying a gray market model on eBay can save a lot of money. What is the risk of buying gray market (imported) Canon cameras? The primary risk is for Canon USA to not honor the standard 1-year warranty that comes with cameras purchased from authorized USA retailers. Sellers usually provide their own warranty and the value of that warranty will depend on the company behind it. Buying used is another way to get a cheap camera. I don't often recommend buying cameras used, primarily because you don't know how the camera was treated and mistreatment can be hard to detect. Buying used gear through B&H or Adorama at least provides a warranty period. Buying during a rebate promotion, especially those involving kits that include a lens and a printer, is a great idea. Don't need everything included in the kit? Sell the unneeded items. The pro-grade printers often included have a significant value. This is Canon's lowest-price, currently-available digital SLR camera, nicely fitting the definition for a cheap camera. 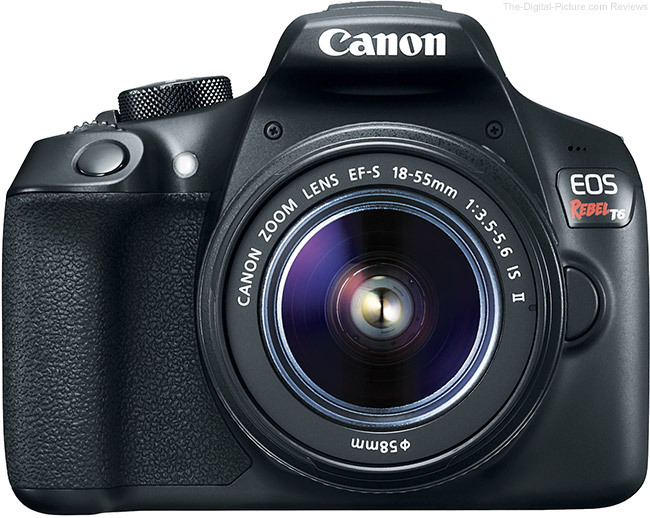 The T6 is from the lowest-end EOS DSLR model line and it is one revision old, resulting in a great price. The image quality per dollar from this model is excellent, making it a bargain. 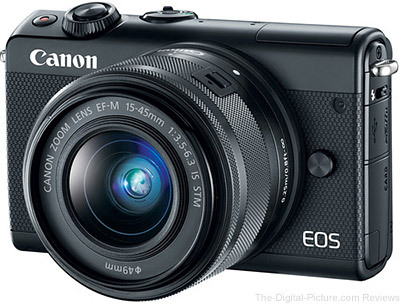 Those wanting a tiny camera but not willing to give up APS-C sensor format image quality should consider the Canon EOS M series cameras. As we are talking cheap options on this page, the current bottom-of-the-line EOS M100 rises to the top of the recommendations list. In this case, bottom-of-the-line is far from inadequate as the M100 features a 24 megapixel imaging sensor and Canon's impressive Dual Pixel AF. 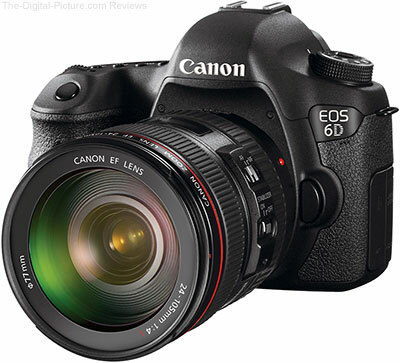 The original 6D brought low price to full frame digital SLR cameras and this model was loved by many. While the Mark II version brought along many great upgrades, none affected how the original performed, though it did push the 6D's price down. There are lower-priced Canon EOS cameras available, but none offer the huge full frame imaging sensor advantage. Your cheap/bargain camera needs an equally-cheap/bargain lens to go with it. The Cheap Lens Recommendations will help you select the right lens for your camera.